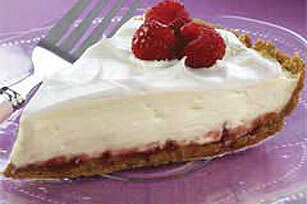 Brighten up your taste buds with this refreshing creamy pudding pie. A ribbon of raspberry adds just the right touch. Beat first 4 ingredients in large bowl with whisk until blended. Stir in 1 cup COOL WHIP. Spread preserves onto bottom of crust; cover with pudding mixture. Top with remaining COOL WHIP and raspberries. Trim 80 calories and 7g of fat, including 5g of sat fat, per serving by preparing with PHILADELPHIA Neufchatel Cheese; 1 pkg. (1 oz.) JELL-O Lemon Flavor Sugar Free Fat Free Instant Pudding, fat-free milk, COOL WHIP LITE Whipped Topping, and a ready-to-use reduced-fat graham cracker crumb crust. Prepare omitting the raspberry preserves. Prepare as directed, using strawberry jam and sliced fresh strawberries.